Ramon Tremosa-i-Balcells is Lecturer in Macroeconomics at the University of Barcelona. He has published books and academic papers in international economic journals about logistics, regional economy, fiscal federalism and monetary policy. He also has written several opinion articles in Catalan newspapers. He is a specialist in Catalan economy, and has focused his most recent research endeavours in Catalan potential economic growth. He was elected Member of the European Parliament for the Catalan coalition Convergència i Unió in June 2009. In the 21st century Catalonia needs infrastructure that is conceived and managed with a global vision, to take advantage of opportunities that today are equally global: the new economic geography of the world offers the coast of Catalonia and Valencia opportunities of the first magnitude, thanks to the recovery of the Mediterranean’s strategic value in world trade. 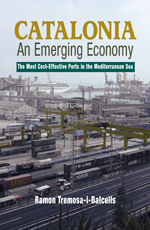 The Mediterranean sea is set to achieve the highest volume of shipping trade in the world in the 21st century. This anticipated expansion will be due in part to the growth of the Asia–Europe trade corridor, complemented by the proposed Suez Canal enlargement. The Catalan ports of Barcelona, Valencia and Tarragona offer the most efficient and cost-effective port entrance to the Mediterranean, and are poised to gain ascendancy over other European ports offering similar services. Economists and business leaders predict that Asia will become the main industrial platform of the world and Europe will become the main purchasing market of the world. Such forecasts seem to be on track given that in 2008 the ports of Barcelona and Valencia surpassed the container traffic (measured in TEUs) of the French port of Marseille and the Italian port of Genoa, and this for the first time ever. Only Catalonia has modern important industrial bases near to the port areas in the Mediterranean sea (this is not the case for Marseille, Genoa or Algeciras); Catalan ports are thus able to add value to semi-manufactured goods imported from the emerging economies in Asia, Africa and South America. It is anticipated that Catalan ports will play a similar role to the Flemish and Dutch ports, which in the twentieth century were at the forefront of the expansion of trade across the Atlantic ocean. Under these circumstances it is not surprising that global logistic operators rate Barcelona as the dominant and most important entrance port for Asian and African trade with Europe in the Mediterranean sea. 3 The Euro, a New Global Currency? 7 What Will Be the Basis of Competitiveness in the 21st Century?